We publish our brief Newsletter during each of our exhibits to pass along information and reviews of the exhibit, photographic tips, selected images and news of other participation opportunities at Image City. We thank you for your interest and we look forward to another great year of fine photographs and events. We hope to see you at each of our 13 shows in 2010. 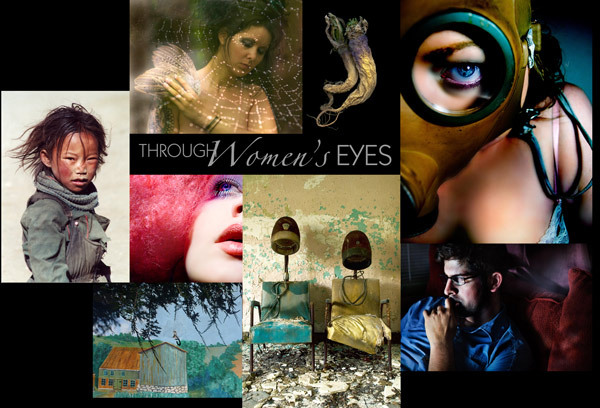 "Photography - Through Women's Eyes"
Photography - Through Women's Eyes opened last week with many great comments about the strength and diversity of the work by the 21 photographers in the exhibit. Peter Marr suggested that "In this truly excellent exhibition, we see Through Women's Eyes, a sense of wonder, and the gift of seeing clearly and vividly." George Wallace, Gallery Partner, who coordinated the show, recalls "I was blown away when the artists delivered the selected works and the show came together in the Gallery." The photographers exhibiting are Sue Alden, Michelle KV Chasser, Lori Farr, Bonnie Gamache, Nan Guzauski, Christine Heusner, Lynda Howland, Kitty Hubbard, Susan Kaye, Margaret Keller, Chris Kogut, Susan Larkin, Kate Lipsky, Joan Lyons, Sheila Nelson, Betsy Phillips, Patti Russotti, Wendy Sacks, Phyllis Thompson, Lois Trieb, and Monika Ueffinger. We are fortunate to have two sponsors supporting Through Women's Eyes. jill-e Designs has several examples of thier stylish and versatile bags in a display in the Gallery. The bags may be purchased from Hahn Photographic. Archival Methods is the second sponsor; they market a wide range of very useful products to display, store, and protect photographs and ephemera. Supporters of the show are Rochester Women's Network, American Association of University Women, and The Women's Foundation of Genesee Valley. For full details of the show click here where you will find a link for our "Preview of the Show" and also the Peter's Picks link. There is no admission fee to visit Image City. Note June 4 is First Friday Gallery Night, Image City is open until 9pm. Peter Marr is back! -- just in time to select his favorite photograph from the current exhibit. Most every show, Peter invests many hours in reviewing each of the photographs by the guest photographers who are exhibiting and then composes a brief review of his picks. Excerpts from his discussions are included here in the newsletter, but, you will want to go to the webpage link to see larger images and the full write-up, or, even better, be sure to visit the gallery to see them in person. 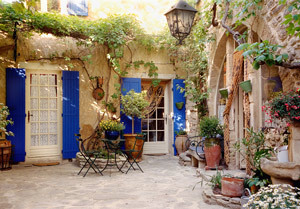 In choosing Chris Kogut's La Maison aux Volets Bleus - Provence, shown at left, Peter observed that "everything about this stunning print, detailed so lovingly by the gorgeous soft lighting, makes one want to explore intimately every nook and cranny. This is the most delightful garden patio that I have ever seen. The sheer range and scope of the plants and flowers is just awesome, all against an eye-catching background, highlighted by the bright blue window shutters. This is such an enchanting scene, and most of us would dearly like to explore the house, particularly the rooms beyond the three doorways." With Aging, shown at right,by Patti Russotti, Peter described that "all of Patti's breathtaking images on canvas are uniquely hung in a fashion hauntingly reminiscent of Chinese paintings and scrolls. The essential quality of her photographs is the emotional impact that they carry, which is definitely a measure of the author's success in translating into photographic terms, her own emotional response to the subjects. In Aging, one could discuss at great length how the powerful vertical format, the sensuous curves of the seed-pod, the sumptuous brown tones of the subject matter, and the featureless black background, all contribute to a dynamic, thrilling print. What may not be so obvious, is how expressively and lovingly nature shapes and forms its many treasures, typified by this seed pod. 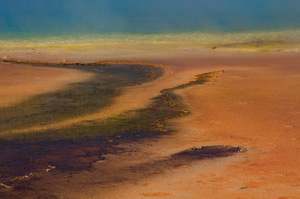 The next of Peter's Picks is Prismatic Sea, at the left, by Lois Trieb. "This print has an expansive range of both warm saturated hues, together with delicate layers of softer pastel colors. Running through this serene abstract scene is a series of meandering intrusions, which often end up not completing their voyage or destination, and end up in a rich oasis of color, with dreams unfulfilled. Happily, the colors are warm, inviting and friendly, as are their peaceful resting places." 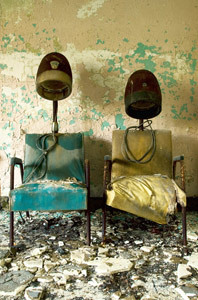 Peter next chose Nan Guzauski's Beauty Parlor, at right, observing that "Abandonment is almost always tragic and heartbreaking, but through Nan's memorable, poignant and haunting photographs, we are given the opportunity to look beyond dereliction. We need to use our imagination and listen to the unspoken narratives of the subjects, to learn more about the lives of the people who once lived in these buildings. Ironically, in today's world, Beauty Parlour could stand alone as an iconic portrait of perhaps two aliens from a distant planet, with bizarre bodies and inelegant necklaces of twisted electrical cords. A frightening thought, maybe, but realistically of course, we know that the hairdryers were, in their time, one of the few available luxuries. Whatever the conditions and tragic circumstances, there must have been sheer elation and excitement with a visit to this room, where not only could one's hair be revitalized, but perhaps hope for a life-changing moment could happen on emerging from under these bizarre-looking machines." In Kate Lipsky's Weaving a Web of Dreams, Peter noted that " The beautiful and moving portrait of a young lady, eyes closed, holding seemingly a fan of a bird's wings, is an excellent image in its own right. Superimpose a dew-bejeweled spider's web over her, and the image takes on an entirely different mood and feeling. Here, we convey an atmosphere by intensifying the elements that compose it, hopefully, to arouse an emotional response in the viewer. The soft lighting and a restricted color palette of warm brown and flesh tones, wonderfully complement the whole scene with a dream-like quality, so in keeping with the conscious and sub-conscious thoughts weaving like a web through her mind. Dreams are an enigma, and mysterious to most of us, so the symbolism of the intricate spider's web, mirroring many of the complex electrical signals we generate whilst asleep, is beautifully done." In Two Dolls by Wendy Sacks, Peter observed that "the soft lighting creates in the young girl a magical, quiet, euphoria, yet all the intricate details in her lacy dress and in her flowing hair are beautifully maintained. There is an ethereal, intimate connection between the girl and her lovingly- held doll, as though they are connected and one with each other. Emotionally and happily, the doll is both visually and importantly, just like the girl was like when she was a little child. Obviously they both grew in years, but only the girl grew in size and maturity. Yet the two still have a powerful bond, and to each, maybe they are still alike and the same size as they were in childhood. This is an outstanding photograph, for all to treasure, particularly for the young girl. A sublime moment in time, artistically and lovingly captured for posterity." We hope that you can see from this selection that the exhibit Photography -- Through Women's Eyes has such a wonderful range of thought-provoking photographs. We appreciate Peter Marr's ability to describe what appealed to him to make his selections, We hope that Peter's Picks will be an additional enticement for you to attend the show, admire the talent and potentially invest in the works of the 21 fine artists demonstrating their excellence. There is much more that will, we suspect, attract you to want to visit to see the full exhibition! Over the years Gallery visitors have asked us for places they could go to participate in image critiquing. Of course we have always offered to critique images as individuals have stopped into the Gallery and asked, but many are concerned that larger group discussion might be too intimidating. Image City Critiques is a new free program we are going to offer at the Gallery providing participants an opportunity to critique and be critiqued in a friendly, constructive, positive environment. We had a good session during the kickoff in May. The next session is Wednesday, June 2nd from 7:00-9:00 pm and we will consistently hold the Critiques on the first Wednesday of each month as long as there are participants. If you'd like to join us, please bring 2 or 3 jpg images that are at most 1MB in size and at most 1500 pixels on the longest side. You may also bring them as a print, on a CD, or on a thumb drive. If you have any questions please contact Don Menges (dmenges@rochester.rr.com) or Gil Maker (gmaker@mac.com). We look forward to meeting with you on June 2nd at 7pm. One of my favorite times to photograph outdoors is on foggy days. I like to use a perspective that involves the phenomena of what I call the 2-F's. One F represents foreground and the other F is fog. Combining the two creates the 2-F perspective. My most successful images using the 2-F concept occur when I am able to find particularly interesting subject matter that I can use as foreground against a foggy landscape. I move in tight on the foreground making it a large and dynamic portion of the image. Often my lens is only 8-10 inches from the foreground. In order to render the entire foreground sharp I usually stop down to an aperture of f-16 or f-22. I can occasionally use f-11, or even f-8, if I'm working with a very wide-angle lens. There is some flexibility with the selection of aperture because the fog naturally increases the softness of the scene and reduces depth of field naturally. The combination of sharp foreground and muted background creates an interesting contrast within the image, and a feeling of depth and mystery are communicated. My example image ends up with two subjects and no middle ground which would not normally be a recipe for success. However, it seems to work. Many say that the foreground lupines in this image are the more dominant subject. I do not disagree. Lupines and Boats in the Fog was captured at Stonington Harbor, Maine just a little after sunrise when there was little wind. Using matrix metering I over exposed the scene by about 1.5 stops. This kept the fog bright and cheerful and provided good exposure for the lupines and greenery. 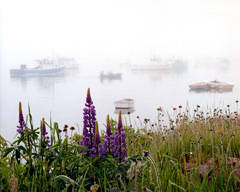 Click Here to see a larger image of Lupines and Boats in the Fog and to review the other photographs in the series and the tips Gary has written. There are only a couple of weeks left for you to enter the Image City Portfolio Showcase 2010 competition sponsored by Lumiere Photo and PixelPreserve. While the response has been good so far with the earliest entries, I suspect that a majority of you are still in the process of making your selections for your portfolio submission. Remember the last date for submissions is June 16, 2010 or June 2, 2010 for the reduced submission fees. All details and the submission form are available at our website www.imagecityphotographygallery.com. What are the prizes? The 8 best portfolios will be exhibited at the Gallery during the summer 2010 and in addition, thanks to our Sponsors Lumiere Photo and PixelPreserve, each of the 8 winners will receive a $250 award certificate applicable towards purchase (after August 13, 2010) of any of many products and services offered by Lumiere Photo and PixelPreserve, as well as 2 complementary hard-bound copies of the limited- edition, high-quality show catalog. It will be specially designed and produced by PixelPreserve, depicting all pictures of the winning portfolios. What is a PORTFOLIO? For this competition a portfolio is a total of 8 (no more - no fewer) of your photographs that represent a specific theme (preferred) or variety of your best work. To illustrate--among the winning portfolios of last year we had the following themes: sailing races, plants/flowers (generic), the Palouse farming country (focused), the evolution of the camera over the years (story). The book from last year's showcase is available at Image City. Do I have my pictures printed and framed at the time of the submission? The answer is no. The submission process is very simple--the portfolio has to be submitted with digital files on CD only. See details on the submission form that you can download at the Image City website. Can I submit more than one entry? You may submit more than one entry. Use one submission form for each entry. The fees apply for each entry. It is exciting, isn't it? So hurry along, select your portfolio, and send your submission CD, submission form and fees by the deadline. You may also bring it to the Gallery. If you have any question, please feel free to contact me at Daniel.Crozet@imagecityphotographygallery.com . All of the Gallery Partners and the Lumiere Photo and PixelPreserve Teams look forward to receiving your submission and participation in Portfolio Showcase 2010. June 2, 2010 Image City Critiques begins at 7pm at the Gallery. June 4, 2010 First Friday Gallery Night, open until 9pm, reception begins at 6pm. This email was sent to svincent@frontiernet.net by info@imagecityphotographygallery.com.